The triangular island of El Hierro is the SW-most and least studied of the Canary Islands. Following intense earthquake swarms since July 2011, a new submarine eruption started in Oct 2011 at a vent ca. 1 km south of La Restinga off the southern tip of the island. The eruption, which could even start to build a new island, is ongoing at the time of updating. Follow the El Hierro news page for the latest events. new pulse of volcanic tremor near La Restinga ? What looks like a new swarm of earthquakes accompanied by strong harmonic tremor appeared on the southernmost seismic station at La Restinga. If it is not due to some local, human-induced work or malfunction, it suggests that the quakes are very shallow, since they don't appear on the signals of other stations. Whatever is happening there will probably become clearer soon. The latest earthquake swarm in the NE part of the island had more or less stopped during the past 24 hours. Some GPS stations showed 2-4 cm uplift during the weekend, which supports the idea of a new deep magma intrusion. A new swarm of earthquakes started yesterday. So far, almost 200 tiny quakes (none above magnitude 3 so far) have occurred in a broad N-S oriented area beneath the NE part of the island at around 18 km depth. A possible explanation includes a new magmatic intrusion at depth (magma accumulating at the lower crust-mantle boundary). No new significant earthquake activity has occurred over the past week, and deformation has stabilized on all stations: the latest crisis can be regarded as over (but it is probably only a matter of time until the next one). The island has remained calm with not much signs of volcanic unrest. Two small earthquakes (magnitudes 2.8 and 1.7) occurred at approx 10 km depth east of La Restinga yesterday, but so far, there have not been new ones since. Tremor is absent except perhaps on some of the stations in the western El Golfo area (CTAB station) and deformation has been stagnating. It seems more and more likely that the crisis is appraching an end (with the likelihood of a new eruption soon becoming less and less). Seismic activity has decreased to normal levels with no unusual signs over the past 24 hours. Deformation has been stagnating or mostly reverted to deflation at most stations. No new earthquakes have occurred, but deformation continues and shows that the current crisis is not yet over. A new pattern is slowly emerging: while the SE areas that experienced rapid uplift (presumably by magma accumulating beneath the crust in that area) are stagnating or even showing slight subsidence (El Pinar), the northern and western areas, in particular the western El Golfo depression have started to experience uplift. The strongest deformation occurred in Sabinosa (GPS station HI03) with ground uplift of almost 3 cm during the past 24 hours. Weak tremor continues also to be present on seismic signals from this area. No new earthquakes occurred since yesterday. The seismic signals at all stations at the same time show a slight increase in what might be weak tremor or wind and ocean-wave noise. The latest GPS deformation measurements show that some new inflation and NE displacement occurred in the northern parts of the island (HI01, HI00 and FRON stations). The other areas and in particular those with most deformation so far (up to 9 cm uplift in the SE part, HI08 and HI09) continue their trend at reduced rate or seem to stagnate. All in all, there is no indication right now that an eruption might be imminent. Most of the times magma intrudes from deeper reservoirs into volcanic systems, the magma remains at depth to form sills and dikes and never erupts, but if this will be the case with the current crisis is impossible to say at the moment. The situation has been calm over night after yesterday evening's M5.1 earthquake (and a handful of aftershocks of magnitudes up to 3.6) off to the west. There are speculations that this quake might have been caused by magma rising in this area and hence, a possible precursor to an eruption west off the island, but the more likely interpretation, given by IGN's experts, is that the quake was a result of tectonic stress induced by the recent deformation of the island. Except abundant rockfalls and smaller landslides, the quake has not caused major damage or injuries, fortunately. Some local roads in the El Golfo area near steep cliffs have been closed. On the island itself, the signs of volcanic unrest have decreased since yesterday afternoon: tremor, still present, has decreased in strength, earthquakes have been mostly absent under the central/SE part of the island, and deformation seems to be stagnating. Whether this is a pause or sign of the near end of the current crisis is too early to say. 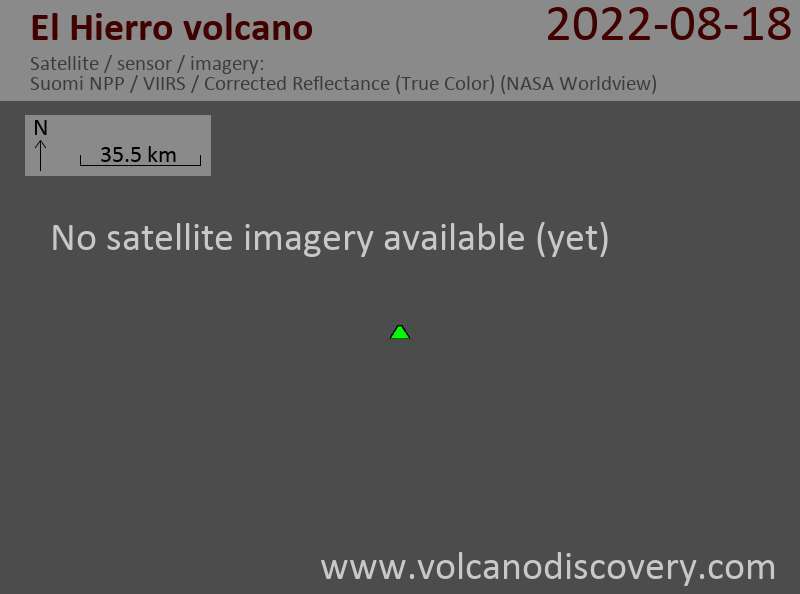 You can check live data at: webcams.volcanodiscovery.com/elhierro. Map of recent earthquakes; the magnitude 5.1 event this afternoon is the red dot west off the island. IGN also lists the earthquake now, as a magnitude 5.1 event at 15 km depth NW off the island, i.e. on the western rift zone axis. A large earthquake of estimated magnitude 5.4 (USGS) occurred just minutes ago. USGS and EMSC place the quake at about 30 km NW of El Golfo at 22.8 km and 10 km depth,respectively, i.e. relatively far away from the area of the recent earthquake swarm and current inflation. However, these preliminary calculation might be updated in the coming hours, which will help understanding whether it is related to the current volcanic crisis on the island. Although earthquakes have largely ceased for the moment, the island experiences ongoing rapid inflation and harmonic tremor, both signs that an eruption could be imminent. The inflation in the SE part near El Pinar and La Restinga has reached almost 10 cm in just a few days by now. Instead of new earthquakes, harmonic tremor (steady low-frequency ground vibration) has appeared 2 days ago and since then been gradually increasing. Both observations, as well as some single long-period earthquakes in the past days, are indicators of magma moving into the system and pressurizing it. This means that the scenario of a new eruption has become more and more likely. It is impossible to say whether and when a new eruption will occur, but it could happen quickly any time. It would probably begin with a series of stronger earthquakes to open up a conduit. Based on the inflation and earthquake patterns, the most likely area would be near the 2011 vent near La Restinga, perhaps even on land. In this case, La Restinga would be the village most at risk. The previously detected very high Radon gas emission values also suggest the presence of new magma and poses a health risk particularly in closed low-lying rooms of buildings especially in southern El Hierro. - INVOLCAN reports increasing Radon emissions preceding the seismic crisis. The most likely interpretation seems to be that new magma has started (again) to intrude into the layer between the mantle and the crust beneath the island and as long as the earthquakes remain at that depth, this magma is rather moving horizontally to form sills. As of now, no eruption seems to be imminent. The new earthquake swarm under the island's central-SE sector continues. So far, about 120 quakes of magnitudes above 1.8 including a handful of possibly felt ones (up to magnitudes 3.2) have occurred since yesterday morning. Preliminary GPS data suggest a new phase of uplift has started as well, which supports the idea that a new magma intrusion is occurring at the base of the upper crust beneath the volcanic island. A new earthquake swarm started under the island today. The earthquakes are located at about 15 km depth under the southeastern central part of the island. IGN recorded more than 40 quakes with magnitudes up to 3.2 so far. Whether the earthquakes are related to new magmatic intrusions at depth is a unknown but a possible scenario. GPS data of at least some stations seem to indicate some deformation, but this is not very clear.